The big event in the night sky this month is a total lunar eclipse, or “blood moon” if you prefer. It’ll be the first one we’ve seen since 2015, and the last one we’ll see around here until 2022. So let’s hope and pray for clear skies on Sunday night, Jan. 20, as the moon ventures completely into Earth’s ruddy shadow and will turn blood red, thus the term “blood moon.” I’ll have much more on this wonderful total lunar eclipse in the coming weeks. In the meantime, the conundrum of stargazing in January is that, while you can have some of the clearest skies and some of the best and brightest of constellations, it’s hard to motivate yourself to move away from that warm fireplace to take in the winter wonderland of the night skies. Murphy’s law of winter stargazing clearly states that the beauty of the heavens is inversely proportional to how many layers you have to put on to go outside. January skies are very pleasing to the eyes but tough on the skin. Not only should you dress for it, you should also be prepared with things like a big thermos of something warm. Try those potassium chloride hand and feet warmers. They do a fantastic job keeping those extremities toasty warm for hours and hours. You can buy them at most sporting goods stores and even hardware stores. Don’t leave your warm home at night without them when you’re making the stars your old friends. Once armed against the chill with an attitude, get out and enjoy the best stargazing of the year. You’ll notice that the eastern half of the Shamokin sky has many more bright stars than the west. Over the last couple of months, the last of the summer constellations have slowly sunk lower and lower in the west, not to be seen again in the evenings until next June. Actually, they didn’t move, we did. As the Earth continues its annual circuit around the sun, the nighttime side has now turned away from the stars of summer. The dominant constellation of autumn, Pegasus the giant winged horse, is still hanging in there in the west. Look for the distinct great square, actually a rectangle, that makes up the torso of the mighty flying horse. With a good pair of binoculars or a small telescope, scan about halfway between Pegasus and the bright “W” that makes up the constellation Cassiopeia the queen, and see if you can spot the Andromeda galaxy; it’s our Milky Way galaxy’s next-door neighbor. Honestly, all you’ll really see is a faint little smudge, but that little smudge is a whole other galaxy, a little larger than our own, nearly two and a half million light-years away. If you’re new to astronomy, one light-year equals almost 6 trillion miles. I’ll have more on the Andromeda galaxy in next week’s Starwatch column. Even though we’re starting to leave the holiday season, the eastern sky is lit up like a very bright and big Christmas tree. There are so many bright stars and constellations. I call this part of the sky “Orion and his gang.” Orion is the brightest of the gang, and at first glance, the mighty hunter looks like a sideways bowtie, but without too much imagination you can see how that bowtie resembles the torso of a very big man. The three bright stars that make up Orion’s belt are in a perfect row and jump right out at you. There are also the bright stars Rigel, at Orion’s knee, and Betelgeuse, at his armpit. By the way, keep your eye on this star because sometime in the next million years Betelgeuse could explode in a tremendous supernova. Elsewhere in Orion’s gang there’s Auriga, the retired chariot driver with the bright star Capella. There’s also Taurus the bull with the little arrow pointing to the right, which outlines the face of the bull with the reddish star Aldebaran marking the angry red eye of the beast. Just above Taurus are the Pleiades, a beautiful bright star cluster that resembles a tiny Big Dipper. The Pleiades star cluster is made up of more than 100 young stars, probably less than 100 million years old. If you stay out after 8:30 p.m., you’ll see a really bright star on the rise in the southeast. That’s Sirius, the brightest star in the night sky at any time throughout the year. If you draw a line through Orion’s belt and extend it to the lower left, it will point right at Sirius, a little more than eight light-years away. The only naked-eye planet available in the evening sky this coming month is Mars. It’s been making a long goodbye in the night sky all this autumn. You can easily see it as a bright reddish “star” in the southwest early evening sky. On Aug. 1, Mars was as close as it’s been to Earth since 2003. It was absolutely brilliant and a great telescope target at just less than 36 million miles from Earth. Now more than 80 million miles farther away, only larger telescopes can detect much detail on Mars. With most smaller scopes it more or less appears as a tiny orange red disk. Mars and the Earth will once again get up close and personal with each other in October 2020. 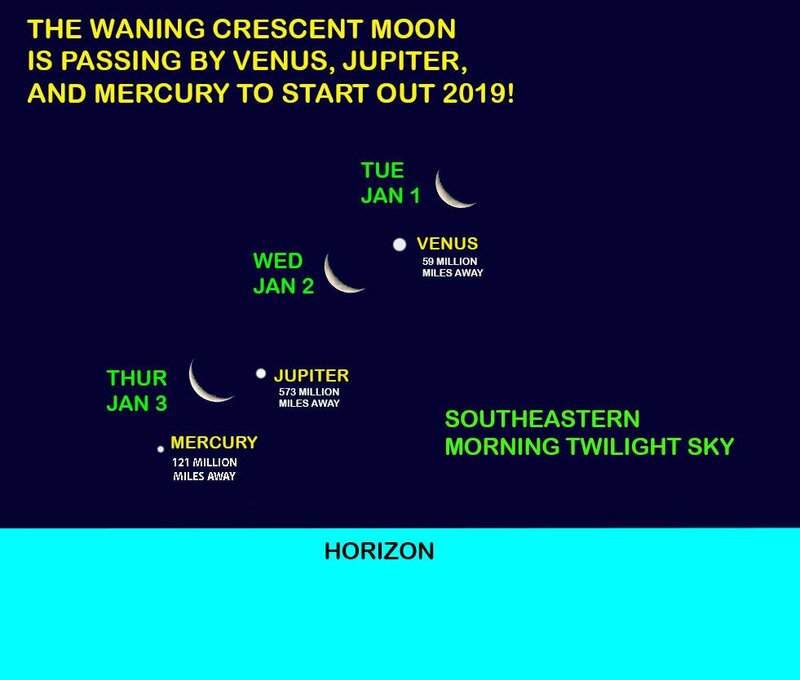 For early morning risers later this week, there’ll be a really special celestial show to kick off 2019. The waning crescent moon will be passing close by the planets Venus, Jupiter and Mercury in the early morning twilight, low in the southeast sky. Don’t miss it! To use this map, cut it out and attach it to a stiff backing. Hold it over your head and line up the compass points on the map to the compass points on the horizon where you’re observing from. East and west on this map are not backwards. This is not a misprint. I guarantee that when you hold this map over your head, east and west will be in their proper positions. Also use a small flashlight and attach a red piece of cloth or red construction paper over the lens of the flashlight. You won’t lose your night vision when you look at this map in red light.